In his most recent exhibition of new works, David Szafranski has included objects that will remind many viewers of art in the good old Western tradition: rigid rectangular frames, stretched with woven material and mounted to the wall. And Mister Szafranski and His Show of 1001 'Illusions' includes four large and six small-to-medium works of that sort. But viewers looking for a more unified, formally focused and, yes, reductive body of work from Szafranski will have to put that insidious urge on hold: The artist is not retreating exclusively into issues or surface and support, flatness and edge. He addresses them, for sure. But, for good measure, Mister Szafranski also includes a pair of the artist's immaculately finished contraptions, more reminiscent of aberrant projects from Popular Mechanics than forays into neo-formalism. Made from lighting and heating elements and metal conduit -- and extending from the wall with cool ferocity -- those last two works are a sort of reality check. Although they possess their own formal rigor, they also serve as foils to objects that beg to be discussed in formal terms. And they remind us that Szafranski is working to reconcile seeming opposites -- illusion and literalness, abstract form and social commentary. 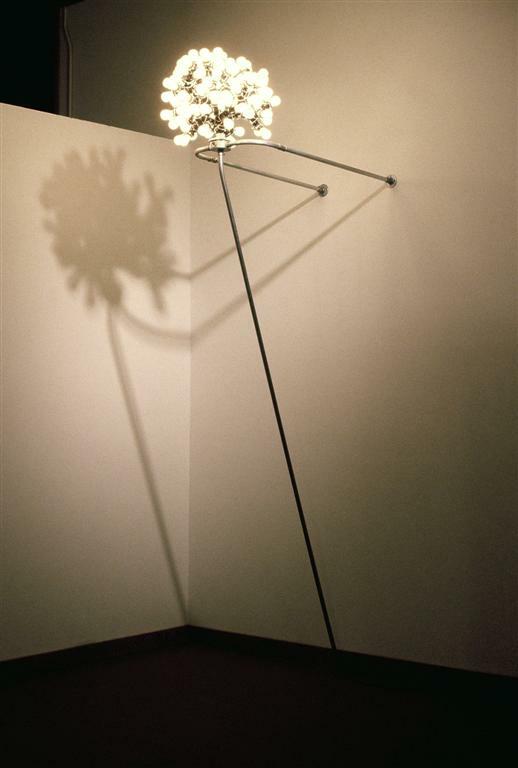 One of these mechanical sculptures, Tall Illumination Device, is a luscious cluster of small light bulbs placed atop a cantilevered, tubular metal structure. It could be a bizarre pipe blowing soap bubbles or a mechanistic hand holding forth an unwholesome bunch of flowers. Certainly it's a refined exploration of the aesthetic potential of industrial materials. So is its companion, entitled Extended Heat lamp Device, which comprises three metal supports that expand into the room from far-flung points on the wall, coming to an intensely concentrated apex crowned by two old-fashioned ceramic-and-coil heating elements. Glowing red hot, the pair of prim little finials threaten the hair and flesh of careless viewers. These are not the only works that invade viewers' bodily space, however. So do the smaller, rectangular works mentioned above. And it is these objects—bracketed at right angles to the wall—and their flush-to-the-wall counterparts that want to be described in the context of Western art traditions. Szafranski says the woven pieces integrate or simulate society's complex web of personal, sexual and political situations. They do so in that they incorporate strips of material connected to real-life situations—including the plastic webbing from outmoded lawn chairs, sections of chenille bedspreads, unfurled strips of old-fashioned movie tickets and strips of bang-caps (more blasts from the past). One large work consists of scores of feet of video tape—black and blank-looking, but recorded with X-rated movies. Two other very large works are woven from blatantly fictive or simulated media. One huge frame is crisscrossed with the whitish tape used in finishing drywall, and printed with the legend POLICE LINE DO NOT CROSS. The other is woven with adding-machine tape that is printed with enlargements of a want-ad for a prison guard. The idea, according to Szafranski, is that these materials symbolize or actually embody barriers to forbidden or privileged zones—bed and boudoir, the scene of a crime, middle-class suburban leisure (or, at least, leisure) and, perhaps, a more innocent childhood that involves cap guns, not assault rifles. Each viewer, of course, brings his or her own perceptions of privilege and accessibility. But, significant as this social commentary is, what I find more interesting is the extent to which these works integrate, simulate and implicate art situations. They do not do so entirely apart from their engagement of social issues, however, it's the art side I find compelling—likely because these works tease that ingrained urge to set flat, rectangular objects into the frame of art history. For instance, the 'illusions' alluded to actually are a literalization of those referred to by Clement Greenberg in his essay, Abstract, Representational, and So Forth. Greenberg notes that, for much of the history of Western art, painters created images that incorporated illusions of the kind of space "in which our bodies move." His solution—the only solution, as he saw it—to what he perceived as painting's dilemma, was flatness. Perhaps ironically, the works Greenberg placed at the apogee of flatness— the stained canvases, devoid of painterly texture and presence, by Jules Olitski and his ilk—still asserted figure-ground relationships that could be read as representations of forms in (illusionistic) space. Indeed, as Greenberg elsewhere noted, so powerful is the association of material stretched on a rigid, rectangular frame that a stretched canvas, devoid of any image, "already exists as a picture." Szafranski's work entirely eliminates illusion in favor of literalness that in-part recalls minimalism or primary structures. These are not pictures, but objects. Michael Fried in Art and Objecthood says that "...the experience of literalist art is of an object in a situation—one that, virtually by definition, includes the beholder." This notion functions in two ways with these works. On one hand, the smaller pieces protrude into the viewer space in a way that doesn't mimic the human form—as would sculpture on or off a pedestal—but uses the wall as support and a means of establishing the works' independent, non-anthropomorphic identity. First perceived as aggressive edges, they create a situation that provokes the beholder to negotiate this shared space in order to view them fully: The engagement is not only visual but bodily, as well. On the other hand, the works are made from materials with such potent identities of their own that they include viewers in situations of memory (bang-caps and chenille). Furthermore, the identity of these materials is asserted to such a degree that what's seen is not the object itself, but the material used to create the object—thus, a work of craft, albeit in a non-functional, minimal manner. Thus the works simultaneously address and echo the motifs and structures of both high/pure art and so-called low/impure/applied art. They possess not only the character of craft—material used to create an object—but directly, in their wovenness—allude to sublime, monumental tapestries and day camp projects (pot holders or, perhaps, chair caning). Again, however, they do so with a profound minimalistic austerity that recalls the work of Donald Judd, even as it mocks the perverse impersonality embodied in Judd's impeccably "crafted" works. In contrast, Szafranski successfully has integrated the situational commentary encoded in his woven materials with the overall structure of the work. In essence, he has created webs that intellectually entangle the insect-like art viewer. Painstakingly woven, fragile webs. We may not physically violate them, but still we struggle to unravel the work through understanding it. Thus we violate the sense of the sacredness of art, of its privileged place in our culture. That privilege is the real illusion. Janet Tyson is an art critic for the Ft. Worth Star-Telegram.